This summer has, so far, proven to be a very busy one (music to an Independent’s ears!). I had the opportunity this June, to travel to 3 different cities, present 3 different talks, and, in the process, I got to meet, interact with, and learn from many different people. My first trip was to San Francisco for the UX Strategies Summit. There, partner in crime Donna Lichaw and I, unleashed our Adaptable Product Roadmaps workshop. Although the workshop is one that we prefer to give as a full day, we were able to successfully present our points and exercises to an eager group in a 3 hour format. The workshop is one that we use to help both clients and practitioners alike, to figure out new products, features, updates to old products, etc, in a prioritized, organized, and engaging way. 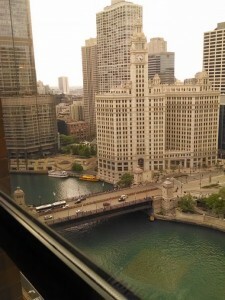 My next stop was in Chicago for ConFab for Nonprofits. There, Donna and I teamed up again, but this time to present our Storymapping: A MacGyver Approach to Content Strategy talk. This is also something we usually present as either a full day, or a few day workshop, but at this event we presented an overview of our method, how it works, outputs from a real-life case study, and then, of course, fielded some great questions. This talk also seemed to be a big hit with the group, and we learned alot from all the feedback. View from my hotel room in Chicago. Lastly, I headed over to Las Vegas for Future Insights Live!, where I debuted my Why I’m Sick of Calling Myself a UX Designer talk. I was extremely excited and nervous for this one. Luckily, I got the intended response from the crowd. That being, an ongoing conversation about the validity of our job titles, and how the topic as a whole effects this industry. I look forward to, hopefully, sharing this talk with many more groups in the future. So, if you’ve been wondering where I have been for the past month or so, wonder no more. Apologies for not keeping up the writing, but there will be more to come later on this Summer and Fall. What am I going to do in the meantime? Well, I finally realized just how exhausting all this travel stuff is. So, besides working on some awesome projects that I hope to write more about in the near future, I’ll be looking to catch up on some sleep. I do hope that you all get to do the same! And, lastly, here are some slides for your viewing pleasure. Thoughts are, of course, always welcome.